Advocate staff photo by MATTHEW HINTON--Graffiti is still faintly seen on the base of a 1911 statue of Jefferson Davis proclaiming "White Pride" on Jefferson Davis Parkway in New Orleans, La. Tuesday, June 23, 2015. Davis was the president of the Confederacy in the Civil War. The street the statue sits on was originally named Hagan Avenue, but the name was changed in 1911 with the statueÕs placement. Advocate file photo by MATTHEW HINTON--Someone attached a peace symbol to a 1911 statue of Jefferson Davis on Jefferson Davis Parkway in New Orleans, La. Saturday, July 4, 2015. Davis was the president of the Confederacy in the Civil War. New Orleans spent only 15 months in the Confederacy and was captured with zero casualties and then spent most of the war on the Union side. The street the statue sits on was originally named Hagan Avenue, but the name was changed in 1911 with the statueÕs placement. Advocate staff photo by MATTHEW HINTON--Someone attached a peace symbol to a 1911 statue of Jefferson Davis on Jefferson Davis Parkway in New Orleans, La. Saturday, July 4, 2015. Davis was the president of the Confederacy in the Civil War. New Orleans spent only 15 months in the Confederacy and was captured with zero casualties and then spent most of the war on the Union side. The street the statue sits on was originally named Hagan Avenue, but the name was changed in 1911 with the statueÕs placement. Advocate staff photo by MATTHEW HINTON -- Lusher Elementary school is seen in New Orleans on Tuesday, June 23, 2015. Advocate staff photo by MATTHEW HINTON--Jefferson Davis Parkway named for the President of the Confederacy passes by Xavier University, a historically black and Catholic university, in New Orleans, La. Tuesday, June 23, 2015. Advocate staff photo by MATTHEW HINTON--A diverse group of people in a street car and an advertisement showing diversity passes by Lee Circle honoring Confederate General Robert E. Lee in New Orleans, La. Tuesday, June 23, 2015. STATUES. SCHOOL NAMES. STREET SIGNS. A monument to Robert E. Lee in a prominent downtown intersection. A marker commemorating the Crescent City White League. A statue of Confederate President Jefferson Davis, placed on a broad, landscaped avenue that also bears his name. 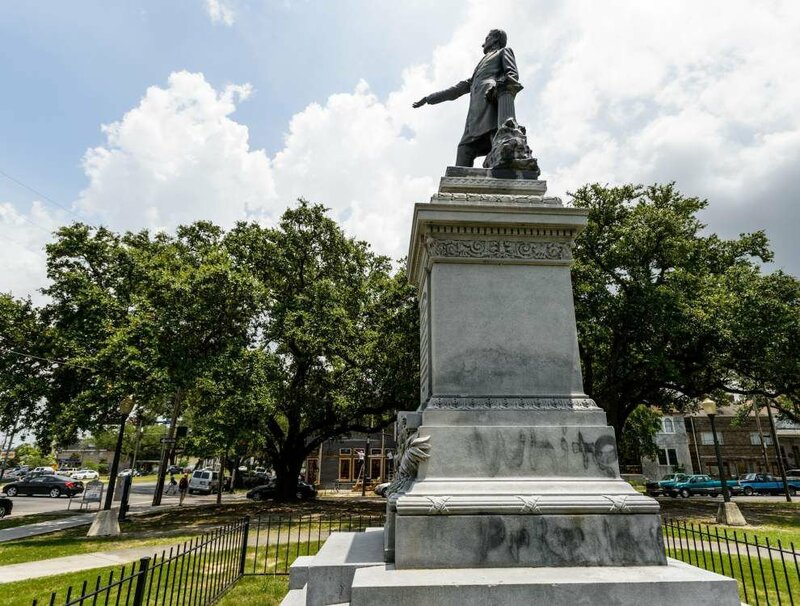 New Orleans is dotted with plaques, monuments and streets that either pay direct homage to Louisiana’s history of white supremacy or to the figures who fought to preserve the slave economy and championed the forced segregation that followed. In the wake of a mass shooting that took nine black lives inside a historic South Carolina church, almost instantly setting off a national movement to scrub public spaces of the Confederate flag, New Orleans may be in for its own hard discussion about the merits of so many official tributes to a past scarred by racism. Mayor Mitch Landrieu’s office, in a statement released to nola.com columnist Jarvis DeBerry this week, said there should be a “close examination” of that memorial and other polarizing statues, monuments, street names and symbols of a bygone era to determine if they “still have relevance” to the city’s future. The symbols “still influence who we are and how we are perceived by the world,” Landrieu’s office said. The Lee memorial, dedicated in 1884, is one of a number of similar monuments across Louisiana — there are also statues of Davis and Confederate Gen. P.G.T. Beauregard in New Orleans — erected as part of the “Lost Cause” movement, a post-Civil War effort to portray the Confederacy as a noble idea. The prevalence of such memorials stands out in a city that today is majority-black and generally liberal in its political leanings. Yet New Orleans is awash with them. The monuments to Confederate generals stand in the same company as streets named after prominent Southern slave owners, like Henry Clay, and schools named for staunch segregationists, like Robert Mills Lusher. This dichotomy has not gone unnoticed in the past. Black residents waged a campaign in the 1990s to change the names of several schools named for slave owners, including William C.C. Claiborne, Louisiana’s first governor. There were 51 such schools in Louisiana when the effort began, said activist Carl Galmon, who led the push. Twenty-six were eventually renamed, he said. The most recent discussion was sparked by the shooting last week at a South Carolina church that shocked the nation. Dylann Roof, 21, is accused of shooting six black women and three black men to death at a Bible-study meeting at the historic Emanuel African Methodist Episcopal Church. Roof, a self-identified white supremacist, reportedly told a friend he wanted to start a race war. The shooting has prompted calls for the banishment of the Confederate battle flag from public spaces in South Carolina. The flag was flown for several decades on top of the State Capitol dome in Columbia, but lawmakers agreed as part of a compromise in 2000 to place it across the street and also to add a monument to African-Americans. The state’s governor, Nikki Haley, said Monday that she supports removing the flag from the grounds of the Capitol. On Tuesday, Wal-Mart, Amazon, Sears and eBay all said they would stop selling Confederate flag merchandise. Unlike South Carolina, Louisiana has not flown the Confederate flag over state buildings, and the local discussion has centered on monuments honoring the Confederacy and its leaders. A stream of Twitter posts on Monday and Tuesday, using the #LeeCircleReplacement, proposed everything from He-Circle, in honor of the Saturday morning cartoon character He-Man; to Brees Circle, after the Saints quarterback; to the site’s original name, Tivoli Circle, as new monikers for the site. 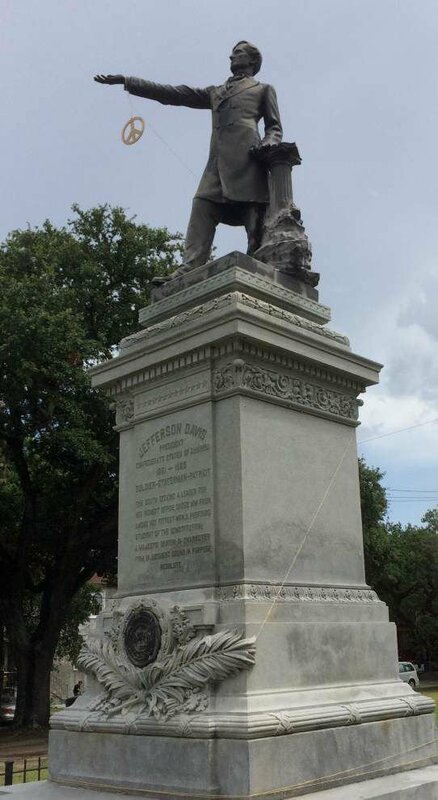 Councilwoman LaToya Cantrell said she has been inundated with emails from constituents calling for the removal of the monument to Davis, which is located at Jefferson Davis Parkway and Canal Street. Not everyone is in support of a change. Taylor said monuments and other tributes to the Confederacy exist to inform residents about the state’s history. He rejects the idea that the symbols are offensive. When similar controversies have flared up in the past, some academics have argued that removing statues and other markers amounts to an airbrushing of history. The early local consensus, however, seems to favor change. Williams said the monuments to Lee, Davis, Beauregard and the Crescent City White League simply don’t reflect the culture and history of New Orleans. The latter organization, made up mostly of Confederate veterans, attempted a revolt against the Reconstruction-era state government in New Orleans in 1874 that, among other things, left the superintendent of the Metropolitan Police injured. Cantrell said she plans to introduce a motion at the next council meeting requesting a hearing on whether the Jefferson Davis statue should be taken down from its post on the street of the same name. She said she has received a number of letters from constituents supporting its removal. Williams said he would support public hearings on the broader topic, with the hope that it would bring about more discussions about race and race relations in New Orleans. Tulane University history professor R. Blakeslee Gilpin agreed and said such a conversation should go beyond symbolism and try to address the broader issues of racism and racial inequality in America.